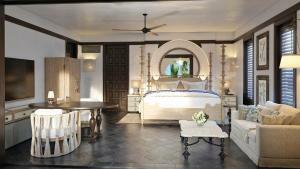 Offering an outdoor pool and a spa and wellness centre, Cap Juluca is located in Shoal Bay Village Beach. Free WiFi access is available in all areas of this resort. The rooms will provide you with a TV and air conditioning. Featuring a shower, private bathroom also comes with a bath or shower and a hairdryer. You can enjoy sea view from the room. Extras include a patio, a terrace and a minibar. At Cap Juluca you will find a restaurant, a private beach area and a tennis court. Other facilities offered at the property include a tour desk, luggage storage and shops (on site).An array of activities can be enjoyed on site or in the surroundings, including golfing, diving and snorkelling. The property offers free parking. This resort is 13 km from Anguilla Airport.